prices and the work done in your neighborhood. I’ve been a homeowner for just over 10 years now (whoa, where does the time go?). And while there are some aspects of ownership I dread – property taxes, shoveling sidewalks and difficult neighbors – there’s nothing I dislike more than dealing with contractors. Or, to be specific, there’s nothing I dislike more than bad contractors. That’s where newly launched site Porch comes in handy. 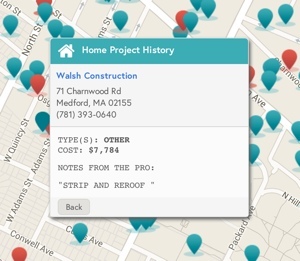 It lets you check out what home improvement work was done in your neighborhood via a simple-to-use map. Just enter in your city or zip code and you’ll be treated to the locations of nearby home service businesses and the approximate locations of nearby private residences that have utilized their services. According to Porch, the company has data from about 1.5 million professionals on 90 million projects in the U.S. I tested out Porch for my old neighborhood of Somerville, MA to see how it might actually benefit me as a homeowner. It was interesting to browse the projects my neighbors recently finished. Since all the homes in my area are about the same age (~100 years old), many are having the same work done. That gives you a clue as to what work your home may need in the future, whether it be a new water heater or a more expensive roof replacement. A few of the projects even have price tags attached, letting you know that it cost one of my neighbors exactly $51,655 to remodel a kitchen and two bathrooms. Knowing costs helps you negotiate and avoid being taken advantage of – one of my biggest contractor fears. Porch also has a collection of pictures (albeit limited) showcasing contractors' work in your area. Home improvement companies can post before, during and after pictures to show off both quality and cost. You can even review contractors on the site after they’ve performed work on your house. And because the site maintains some pretty detailed records of where work was done, Porch knows whether your review is legit or not. The Porch service, unlike its main competitor Angie’s List, is free for homeowners to use and peruse. Contractors can upload and show off their work for free as well, or pay a $35 monthly fee to promote and highlight their projects. The relatively new Porch is far from perfect right now, but like that old fixer upper you’re considering buying, it’s “got good bones.” As more people use the site, upload pictures and review contractors, the already rich data set will get even more useful. Even now, when you combine Porch with other contractor comparison services like Home911, ClubLocal and Angie’s List, you'll have plenty of tools at your disposal to take all the dread out of hiring someone to make your house a home. You can check out Porch for yourself by visiting its website at porch.com.